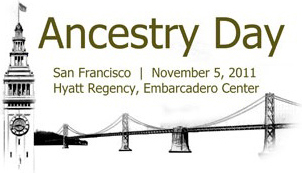 Ancestry Day San Francisco went well today. The numbers I heard for registration varied between 900 and 1,000, but counting all the volunteers it had to be least 1,000 attendees total. Everything seemed to run very smoothly, and the California Genealogical Society had plenty of people around if you needed help. I did several consultations with attendees who had questions on next steps in their research, I taught one class, and still managed to go to two talks myself, so it was a busy day. Most of my consultations were on Jewish genealogy, and along with making suggestions for additional research I shared a list of resources for Jewish research in the San Francisco Bay area. 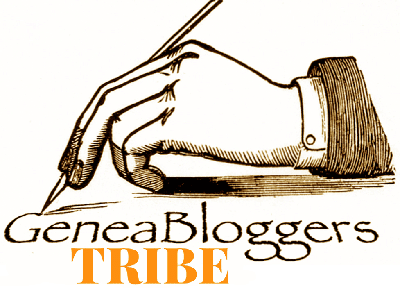 I also tackled questions about German research and a deadbeat husband in Oklahoma. I think I was able to give everyone good advice on what to do next. My class went incredibly well. The ballroom was pretty packed with about 140 people, probably the largest group I've had for my online newspaper talk. And it was the first time I've used a microphone for the class! I'm still pretty sure everyone would have been able to hear me (many years of vocal training have taught me how to project my voice very well), but the AV guy convinced me he didn't want to catch any flak, so I gave in. Several attendees came up at the end to tell me they really enjoyed the talk, including the senior reference librarian from the Oakland Public Library. That was a particularly special compliment for me, as I respect her opinion very much. The first class I attended was about Fold3.com, the new, modified verison of Footnote.com since that company was purchased by Ancestry.com. I picked up quite a bit of useful information. The most promising was that the acquisitions division is aware of the U.S. Army morning reports in Kansas City and is trying to work out an arrangement with the National Archives to digitize them. These morning reports aren't exactly a substitute but can help with research where the records are missing due to the 1973 fire at the National Personnel Records Center in St. Louis, Missouri. These records have not been microfilmed, so currently you must travel to Kansas City to view them. The speaker told us that the majority of the indexing on Fold3 is done manually, not by OCR scanning, which I think is a good thing. He also mentioned that the indexing is done overseas, however, but didn't say if any quality control or checking was conducted. The other interesting tidbit was that I learned what happened to SmallTownPapers on the site. Apparently the original license was extremely favorable to SmallTownPapers, and they were not willing to renegotiate the terms, so the decision was made to drop the license. That's a shame, as it was convenient to have that bundled with the Footnote/Fold3 subscription, but it was a logical business decision. On the other hand, SmallTownPapers is now a free site, but I haven't been able to determine if they're offering the same content they did previously. If they are offering the same content, and it's free now, then what was the point in Footnote licensing it before? And if it isn't the same content, what happened to the rest of it? The second class I took was a mixed bag. Some of the information I was familiar with, some was new and helpful, but some I knew to be inaccurate. It's always frustrating when a speaker gives bad information, but it can be more of a problem for beginners, because they tend to have less experience to critically assess that information. Ah, well, such is life. I did learn something new, so overall that makes it positive, right?